The Kari Traa Trove Half-Zip Running Jacket is warm enough for outdoor cold-weather running but won't leave you overheating at the gym. Thanks to a fitted silhouette and mesh ventilation, this lightweight jacket pulls moisture off your skin and helps it quickly evaporate for maximum warmth. It's great for outdoor running, with reflective detailing and thumb holes to ensure the sleeves stay in place. Four-way stretch fabric and an ergonomic sleeve shape ensure comfort during your next cold-weather workout. 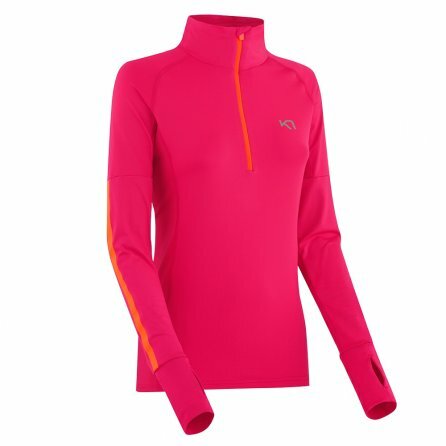 Quick-dry fitted fabric keeps you warm by quickly pulling away moisture and perspiration. A high collar and ½-length zipper allow for ventilation control. Reflective detailing helps you stand out when running in limited-visibility conditions.